So...back in December of last year I set out on a New Year's resolution of completing a dozen designs in a year. I was going to take one room per month in my house and complete the decorating. Wanna know how many rooms I have shown? ONE...one room. That is not so hot. I have actually almost finished 3 rooms, including my craft room and guest bathroom, that hopefully one day soon I will get around to posting. But, I have a room hanging over me right now- the DINING room. This room is the most neglected and will be hosting Thanksgiving in a month. The to do list includes: wainscotting, painting, slipcovering chairs, finding a buffet, curtains, a rug, and so on and so on. It is safe to assume this will NOT be ready in a month. But, I did complete one task- and in true Shannon style, this was not even on the to do list, because I am a procrastinator like that! 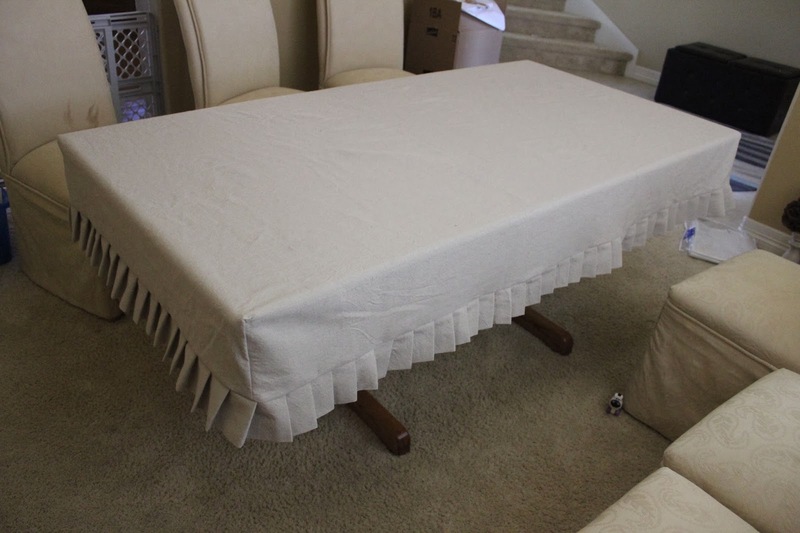 So, the story behind this tablecloth is that I was originally going to refinish the table it is on top of. My parents gave us this table as a hand me down and it is a solid table, but no longer our style. I wanted to give it a Pottery Barn black finish but then changed my mind and decided to buy a table, all to realize I am way too cheap to buy a table. I am hesitant to refinish it and I don't have the time right now, so I found a cheap way to give it a new look. While I realize this after photo isn't quite a wow moment...hopefully when all the other pieces of the room come together it will be. For now, this room is still a space housing empty boxes, unused furniture, and other random items...but I am working on it! 1. Prep your drop cloth. You should not use it straight out of the package. It is stiff and needs to be washed. I washed this one a couple times with extra fabric softener to get it to feel the right way. I plan on bleaching another one for the chair slipcovers and hope it will turn out. Without bleaching it, it will give you a linen type of look. 2. Measure your table and determine your length and width. 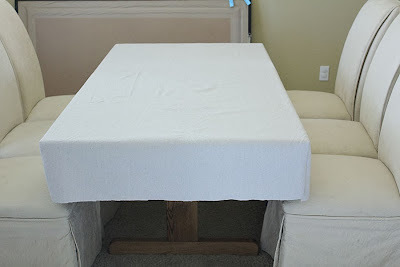 For my table, I used my length and width plus 8 inches of overhang on all sides. My table measured 70 inches x 36 inches. Cut a piece of drop cloth for your length x width plus overhang. Complete the fitted corners by using this tutorial. 3. Cut strips for your pleats. I wanted a four inch tall pleat, so I would need 8 inch tall strips that will be folded in half times twice the diameter of the table. I cut several 8 inch pieces by tearing the drop cloth. It tears in a straight line so you measure out 8 inches, make a small cut, and then tear all the way across the fabric. Once you have enough torn, sew the short sides, right sides together on the ends to create one long strip 424 inches long...yep, it is a long piece of fabric! 4. Next, iron the pleat strip in half length wise, wrong sides together. 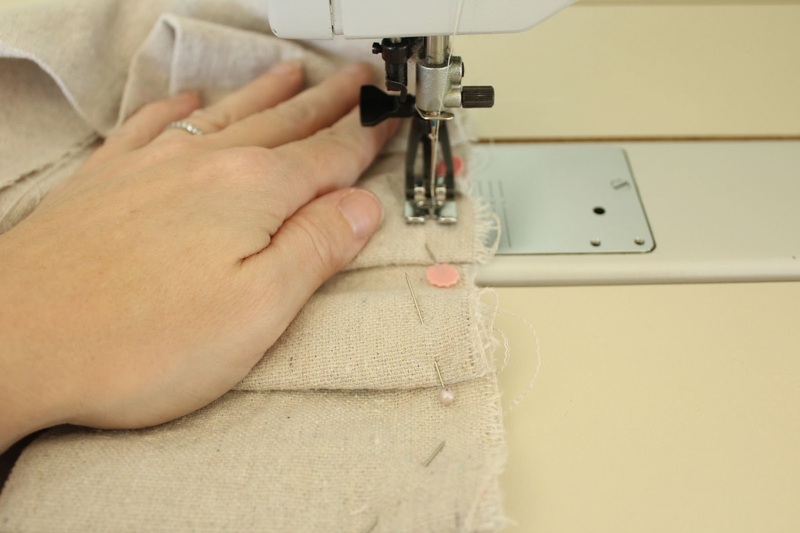 Begin to make your pleats. 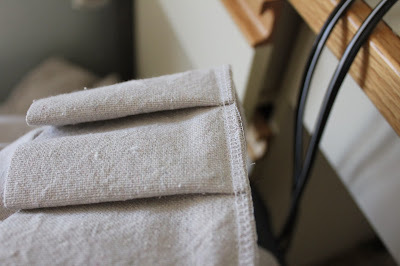 For mine, I decided to make my pleats every 3 inches and 1 inch deep. To do so, I placed my ruler on the edge, measured out 3 inches, then folded the fabric back on itself to the one inch mark and pinned. Then I kept repeating that process, ironing every few pleats, all the way around the entire strip of fabric. 5. Once you have the pleats pinned, run a basting stitch on the top unfinished edge and remove the pins. This step is up to you, but you may want to serge the edge. Drop cloth frays easily and can get messy at this point. 6. Now, take your fabric and pin it to your fitted table cloth. I played with mine a bit before deciding where I wanted it to fall. I ended up pinning it, right sides together, at about the 7 inch mark on my table cloth overhang. I pinned it all the way around until I came to the end of the fabric. 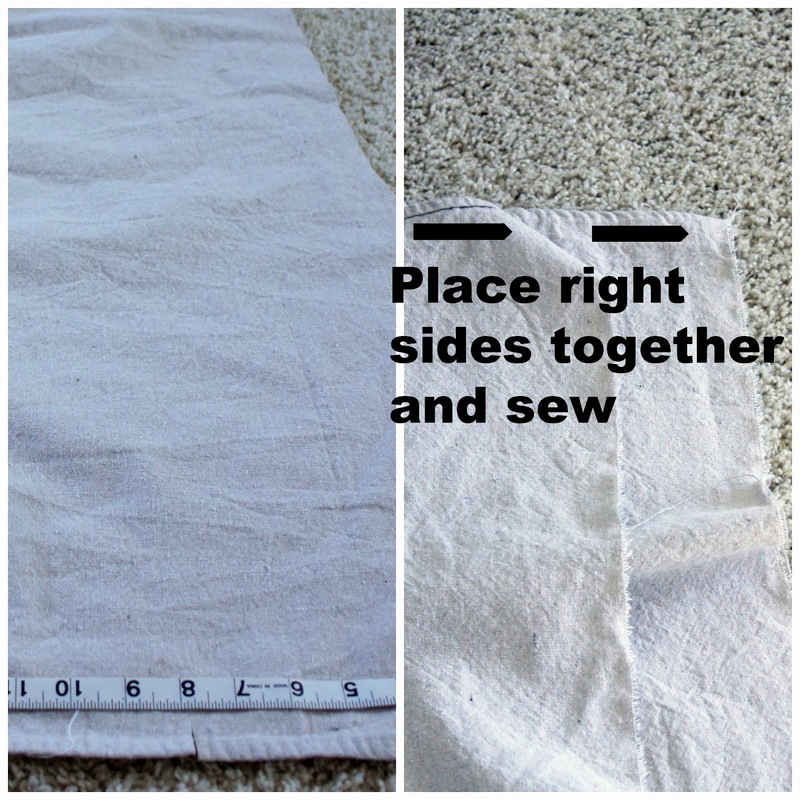 I sewed my two pieces together prior to pinning the last section. There is a seam instead of a pleat here, but I think it blends in pretty well. 7. 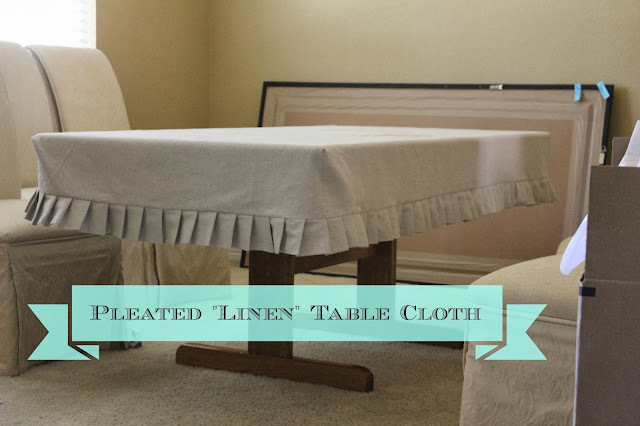 Sew the pleats on, trim the seam and serge or zig zag stitch the seam to prevent fraying...and, viola, inexpensive table cloth that can easily be dressed up for holidays. This is gorgeous! Where do you get your drop cloths from? I love this. Think I will make some pleated tablecloths now! !